60 | TH E M R EP O RT SECONDARY MARKET THE LATEST O R I G I NAT I O N S E R V I C I N G DATA G O V E R N M E N T S E C O N DA R Y M A R K E T FHFA: Mortgage Loan Limits are on the Rise The Federal Housing Finance Agency announced the 2018 maximum conforming loan limits for mortgages to be acquired by Fannie and Freddie. 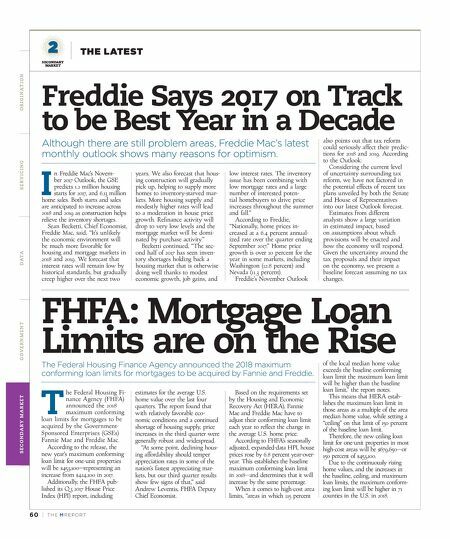 T he Federal Housing Fi- nance Agency (FHFA) announced the 2018 maximum conforming loan limits for mortgages to be acquired by the Government- Sponsored Enterprises (GSEs) Fannie Mae and Freddie Mac. According to the release, the new year's maximum conforming loan limit for one-unit properties will be $453,100—representing an increase from $424,100 in 2017. Additionally, the FHFA pub- lished its Q 3 2017 House Price Index (HPI) report, including estimates for the average U.S. home value over the last four quarters. The report found that with relatively favorable eco - nomic conditions and a continued shortage of housing supply, price increases in the third quarter were generally robust and widespread. "At some point, declining hous - ing affordability should temper appreciation rates in some of the nation's fastest appreciating mar- kets, but our third quarter results show few signs of that," said Andrew Leventis, FHFA Deputy Chief Economist. 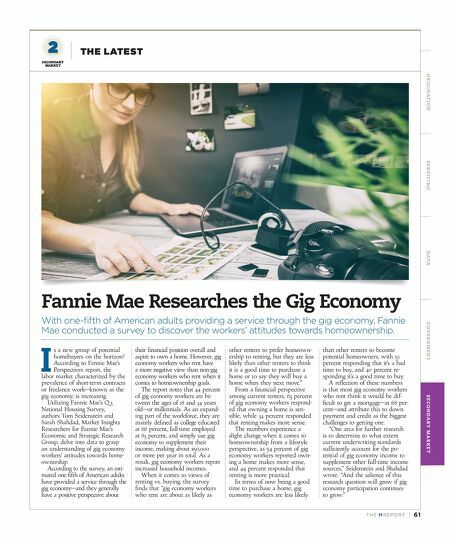 Based on the requirements set by the Housing and Economic Recovery Act (HERA), Fannie Mae and Freddie Mac have to adjust their conforming loan limit each year to reflect the change in the average U.S. home price. According to FHFA's seasonally adjusted, expanded-data HPI, house prices rose by 6.8 percent year-over- year. This establishes the baseline maximum conforming loan limit in 2018—and determines that it will increase by the same percentage. When it comes to high-cost area limits, "areas in which 115 percent of the local median home value exceeds the baseline conforming loan limit the maximum loan limit will be higher than the baseline loan limit," the report notes. This means that HERA estab - lishes the maximum loan limit in those areas as a multiple of the area median home value, while setting a "ceiling" on that limit of 150 percent of the baseline loan limit. Therefore, the new ceiling loan limit for one-unit properties in most high-cost areas will be $679,650—or 150 percent of $453,100. Due to the continuously rising home values, and the increases in the baseline, ceiling, and maximum loan limits, the maximum conform - ing loan limit will be higher in 71 counties in the U.S. in 2018. Freddie Says 2017 on Track to be Best Year in a Decade Although there are still problem areas, Freddie Mac's latest monthly outlook shows many reasons for optimism. I n Freddie Mac's Novem- ber 2017 Outlook, the GSE predicts 1.2 million housing starts for 2017, and 6.13 million home sales. Both starts and sales are anticipated to increase across 2018 and 2019 as construction helps relieve the inventory shortages. Sean Becketti, Chief Economist, Freddie Mac, said, "It's unlikely the economic environment will be much more favorable for housing and mortgage markets in 2018 and 2019. We forecast that interest rates will remain low by historical standards, but gradually creep higher over the next two years. We also forecast that hous - ing construction will gradually pick up, helping to supply more homes to inventory-starved mar- kets. More housing supply and modestly higher rates will lead to a moderation in house price growth. Refinance activity will drop to very low levels and the mortgage market will be domi - nated by purchase activity." Becketti continued, "The sec- ond half of 2017 has seen inven- tory shortages holding back a housing market that is otherwise doing well thanks to modest economic growth, job gains, and low interest rates. The inventory issue has been combining with low mortgage rates and a large number of interested poten - tial homebuyers to drive price increases throughout the summer and fall." According to Freddie, "Nationally, home prices in - creased at a 6.4 percent annual- ized rate over the quarter ending September 2017." Home price growth is over 10 percent for the year in some markets, including Washington (12.8 percent) and Nevada (11.3 percent). Freddie's November Outlook also points out that tax reform could seriously affect their predic - tions for 2018 and 2019. According to the Outlook: Considering the current level of uncertainty surrounding tax reform, we have not factored in the potential effects of recent tax plans unveiled by both the Senate and House of Representatives into our latest Outlook forecast. Estimates from different analysts show a large variation in estimated impact, based on assumptions about which provisions will be enacted and how the economy will respond. Given the uncertainty around the tax proposals and their impact on the economy, we present a baseline forecast assuming no tax changes.